The income tax cut from 5.5 to 5.25 percent scheduled to take effect Jan. 1 will primarily benefit the state’s wealthiest citizens and take money away from a budget now facing a $500 million shortfall. Legislators and Gov. Mary Fallin could delay the automatic cut-it’s going into effect because revenues rose the required 4 percent-but it appears unlikely that will happen. Let’s be clear: Cutting taxes on the rich as state employees and teachers face layoffs and furloughs is not fiscally responsible and ignores the lingering impact of cuts in state government in previous years. Gene Perry, an analyst with Oklahoma Policy Institute, presented the breakdown of the upcoming tax cut in an insightful post on the organization’s blog. Using information from the Institute on Taxation and Economic Policy, Perry points out that the state’s top 20 percent in terms of household income will receive three-fourths of the tax cut.
. . . the top 20 percent of Oklahomans take home almost 3/4ths of the tax cut. More than a third of that goes to the top 1 percent. The bottom 60 percent of Oklahomans together receive only 9 percent of the benefit. 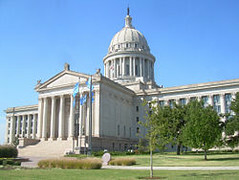 Forty-three percent of Oklahomans would receive no tax cut at all. The fact that 43 percent of Oklahoma’s won’t even get a tax cut is one startling fact. Another fact that stood out for me in Perry’s post is that “middle” income Oklahomans (incomes of $31,200 to $51,800) will receive a paltry $24 tax cut while the top 1 percent (incomes of $399,000 or more) will receive $1,930. Some GOP political leaders here will undoubtedly make these arguments about the tax cuts: (1) The richest people will get the most out of the cut because they pay the most in taxes, (2) and tax cuts in general stimulate the economy. But the truth is the country’s wealthiest people have seen their incomes soar in the last three decades or so as middle-class wages have stagnated. The middle class and poor proportionally pay more of their income in taxes here than rich people. It’s the middle class and poor who need a break, not rich people. Also, tax cuts that are virtually meaningless to the middle class will not stimulate the economy. It’s far less likely that rich people, who get the $2,000 or so cut, will actually spend the money. Meanwhile, state Sen. Tom Adelson (D-Tulsa) placed an amendment in a bill last week that would actually abolish the state income tax. The amendment was supposedly intended to call Republicans on their tax-cut rhetoric about eliminating the income tax, but the GOP called the Democratic bluff and the bill passed in the Senate by a landslide 39-8 vote. Political observers say the amendment will undoubtedly be removed before its final passage. Obviously, it’s difficult not to see Adelson’s move as partisan political theater. I’m left unsure it was worth the effort. State employees and teachers here and elsewhere face a great deal of uncertainty, if not downright fear, right now. Playing around with a major revenue stream for state government only adds to the uncertainty. The prudent thing for political leaders to do would be to delay the tax cut scheduled for Jan. 1, and then develop long-range taxation structures that are equitable and provide adequate funding to government agencies.